Around the world there are billion of users have to use Android phone in his daily routine life. Android phone are too much popular due to cheap cost and great features. Today we have to discuss how to use smart lock to remove password at trusted place on Android Lollipop. 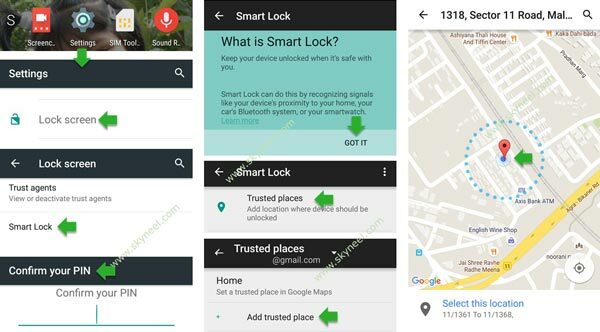 Smartlock is an important facility for Android Lollipop. With the help of smart lock you will be able to keep your device unlocked when it’s safe with you. Smartlock facility is able to recognizing the signals like your device’s proximity to your home, car’s Bluetooth or smart-watch. If you want to run smartlock facility on your Android phone then you will have Android 5.0 or upper version. There is no need to fill the pin number to unlock your phone with the help of smartlock facility. If you want to use this feature then first you have to turn on the smartlock feature on your Android phone. Step 1. Tap on the Settings option on your Android Lollipop. Step 2. Tap on the “Lock screen” option which is placed in the “Device” group . Step 3. Tap on the “Smart lock” option which is placed in the “Screen security” group. Now you have to fill the password on your Android Lollipop and tap on the “Next” button. Step 4. Tap on the “Trusted places”. Now, tap on the Add trusted place and add any required trusted places either your home or office as per your need. Choose or pick a trusted place with the help of Google Maps on your Android Lollipop. Note: During applying smart lock facility on your Android Lollipop internet connection is turn on your device. Now, you will get an unlock icon at your home screen. When you reach at particular location, there is no need to fill the password to unlock your phone. If you move at another location, in that case your device is automatically locked and you have to fill the password to unlock your phone. You can also lock your phone at trusted place by tapping on the unlock icon on your Android Lollipop. Now your device is locked until you manually unlock. If you want to remove the trusted places from your smartlock option then you have to tap and hold-on trusted location and tap on the “Delete” option. Now, you will get a lock icon on your device home screen and you need to enter the password to unlock your device. I hope after reading this article you will be able to use smart lock to remove password at trusted place on Android Lollipop. This guide is helpful for all those Android Lollipop users who don’t want to keep lock on any trusted place. If you have any suggestion regarding this article then write us in the comment box. Thanks to all.